Mastering the art of blackjack means figuring out tons of details. While it may look complicated at first, in reality it just a bit of study. We explain some important concepts for you. Blackjack looks like a pretty simple game on the surface, but the more one plays the more one realizes that it is a game of minor details and complex problem solving. If you practice enough the game will become second-nature, but in the beginning it takes a lot of careful study and painstaking practice. And before you can make money using advanced strategies like shuffle tracking and card counting systems you learn the tenets of basic strategy inside and out. That’s because “basic” strategy isn’t always as simple as you would expect. This piece will explain some aspects of blackjack that are often confusing to beginning players. Standard blackjack strategy says that landing a 17 puts the player in purgatory. It’s not a very strong hand, as the dealer has a pretty good chance of beating it without busting. On the other hand, hitting on a 17 is simply too risky. What are the chances that you hit and receive a four or lower? 31 percent (the inverse is that the bust rate is 69 percent). You need to stay put and hope for the best. But a soft 17, that’s an entirely different story. That means there’s an ace hiding under that six, so you need not worry about busting. Actually, a soft 17 is one of the best hands you can have, because you can keep hitting until you get close to 21. That’s why at most casinos the dealer is required to hit in this situation; it pushes up the house edge. If you can find a table in Las Vegas or Atlantic City where the dealer stands on a soft 17, don’t hesitate to sit down. Splitting is another facet of blackjack that is confusing to many beginners but not hard to grasp after a thorough explanation. What it allows you to do is split your initial two cards and make two separate hands. This means that you put twice as much money on the table (two hands means two wagers), doubling your risk but your potential rewards. You should do it when the cards appear to be in your favor. It depends on the dealer’s upcard, but any blackjack strategy chart will tell you to always split a pair of aces. Two aces add up to a paltry 12, but splitting them gives you the chance of building two strong hands, and probably at least one blackjack. You should also split pairs of 8s or 9s, except when the dealer shows a 7, 10 or ace as an upcard. Never split tens, as you have an extremely high chance of winning if you stay put. It’s just not worth the risk. The dealer’s upcard only shows you half of their hand, but if used properly this information can tell you a lot. The dealer has an average bust rate of 28.36 on any given hand (slightly lower than yours if you do what your blackjack strategy chart says), but that number edges upward when certain upcards are present. When the dealer shows a four, five or six his/her bust percentage is over 40 percent, so you should play more conservatively. Anything above a six and you are more likely to bust than the dealer is. An ace upcard? The bust rate is only 11.65 percent, so you’d better hunker down and find a way to beat them straight up. Winning at blackjack means first and foremost knowing what to do with your own hand, but once you’ve got that figured out, be sure to pay attention to what’s happening on the other side of the table. Insurance is an option you can use if the dealer shows an ace upcard. The chances of him/her beating you with a blackjack are decently high (we’ll get to the specifics in a minute), so you can take out insurance against that outcome. You put up half of your initial wager as a side bet, and if the dealer does land a blackjack you break even (the payout on the insurance offsets the money you lost on the hand). If the dealer doesn’t have a blackjack you lose the side bet, but can still win even money overall if your hand beats theirs. Remember, insurance is a side bet completely separate from the basic hand. 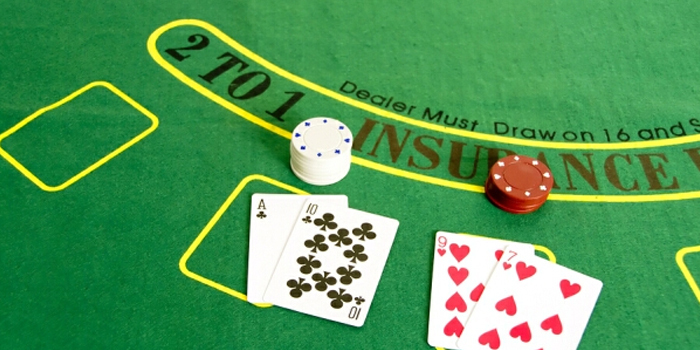 Should you take out insurance when the dealer shows an ace? No. Statistical analysis shows that players who consistently opt for insurance lose more money over a prolonged period of time than those who don’t. That’s because in most cases the dealer won’t end up with a blackjack, in fact, two out of three times they won’t. Some pretty successful blackjack players swear by insurance, and it is a good way to reduce variation, if that’s your goal. But for the vast majority of players, it’s simply a waste of money.